Tomorrow, 28th June, is your last chance to apply for the two Virgin Atlantic credit cards with the sharply increased sign-up bonuses. To be honest, because the two British Airways American Express cards continue to have an enhanced bonus, I reckon that Virgin Atlantic will run another offer soon. If you want to lock in a good deal, however, you should apply today or tomorrow. Remember that you can have BOTH of the Virgin credit cards. If you already have Black, there is nothing to stop you adding the free White card for a cheeky 10,000 extra miles! Virgin Flying Club offer two different credit card options. There is a free ‘White’ card and a £140 fee ‘Black’ card. Each comes in the standard MBNA double-pack of an American Express and a Visa. Unlike the British Airways American Express cards, MBNA is happy for you to have BOTH of the Virgin cards. Whilst I would not recommend this, I know that some HFP readers in the past have applied for both at the same time and received both. This does put you under some pressure to hit the spending targets on both cards at the same time. The free card is the Virgin Atlantic White Credit Card. There is NO annual fee with this card, and the sign up bonus is 10,000 Virgin Flying Club miles. The usual bonus is just 3,000 miles and it never goes above 10,000 miles so this is as good as it gets. 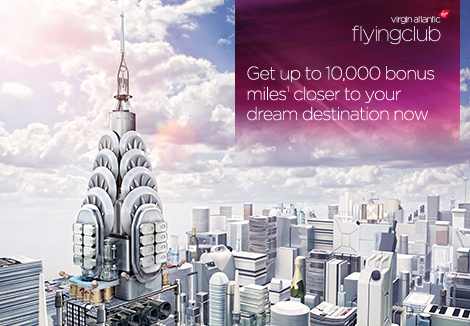 You will receive 3,000 miles immediately and a further 7,000 miles when you spend just £1,000 in the first 90 days. Should you decide to keep the card, you will earn 1 mile per £1 spent on the Amex and 0.5 miles per £1 spent on the Visa. My full review of Virgin White is here. The application page is here. The representative APR of the card is 22.9% variable. The more generous fee-carrying card is the Virgin Atlantic Black Credit Card. This card comes with an annual fee of £140, with a sign-up bonus of 25,000 Virgin Flying Club miles. The standard offer on this card is 18,500 miles so the additional bonus is 6,500. You will receive 18,500 miles with your first purchase and a further 6,500 miles when you spend £3,000 in the first 90 days. We have seen this bonus as high as 32,000 miles in the past. That was before the new EU interchange fee caps came in, however, and I would be surprised to see that deal coming back in a hurry. The earnings rate for the Black card is EXCELLENT. You earn 2 miles per £1 on the American Express and a whopping (compared to the competition) 1 mile per £1 on the Visa. My full review of Virgin Black is here. The application page is here. The representative APR of the card is 57.4% variable including the fee, assuming a £1200 credit limit. The annual fee is £140. There are also two long-term incentives available with the Virgin cards although only Amex spend counts towards them. The White card offers an upgrade voucher (from Economy to Premium Economy only) for a miles redemption when you spend £10,000, and a second at £20,000. The Black card offers the same vouchers at £5,000 and £10,000. Both cards also offer a less useful incentive – a voucher at £15,000 (White) or £7,500 (Black) for a free companion seat – excluding heavy taxes – when you buy a semi-flexible or flexible ticket in any class. These have recently become slightly easier to use (because you can qualify with a cheaper type of cash ticket) but are only likely to make sense in Premium Economy. More information on these can be found in the reviews which I link to above. MBNA does NOT offer a pro-rata refund when you cancel your card. Your £140 fee for the Black card is a sunk cost. You are therefore (effectively) paying £140 for the additional 15,000 miles on the Black card, since you could get 10,000 miles for £nothing by getting the White card instead. How can you earn more miles? It is also worth remembering that you can transfer Virgin Flying Club miles into Hilton Honors points (at 2:3) and IHG Rewards Club points (at 1:1). Getting one of these cards may be a way of giving your Hilton or IHG account a boost. With IHG, the transferred points even count for status. Please note that the application links above are our ‘refer a friend’ links and we receive 3,000 miles if you use them to apply. You get exactly the same deal as if you had applied directly. Thank you for your support of the site. I asked MBNA 2days ago for a referral link to refer my Partner for this card but I haven’t heard back yet so may miss this offer. There must be an easier way to refer people for this cards? If travelling through the VS Clubhouse in London then make sure to ask about applying for the credit card there – 12k White and 32k Black, triggered by first purchase, so 44k for £140 outlay! Brochures they have are pretty nice (magnetic closures, nice card), so I suspect the deal will continue in the lounge for a wee while yet. Also remember when opening second card you can ask MBNA to transfer some of your limit for existing card over to it. Thanks for recent posts about that Alan! Definitely intending to sign up next time I’m flying out for work in next few months. Am interested to see what the non-Amex MBNA offer will be for the Virgin card(s) to replace the Amex and whether that might be worth waiting to apply for instead. Agree, will be interesting to see what they offer. Am planning to close White one in a month or so once points post, so could always look at churning onto whatever new thing they offer. Do I need to call MBNA to ask? To ask for credit limit transfer? Yes if you want to do so. I found they gave me a big limit on initial Black application therefore when I applied for White they wouldn’t approve it straight away, hence why I called them. We have the white card already and received the bonus – if we cancelled it now do you think we would get the bonus again if we got offered to sign up in the Clubhouse on 22/8 or would that be too soon to get the bonus again? Ok might give it a try! I took the clubhouse offer at £140 a few weeks ago and so far have got 18k bonus with another 14k to follow. From your post it seems to indicate that BOTH the white (companion) and the Black seem to attract a bonus at first use. Am I miss understanding something? Correction 13.5k not 18k received so far. Tried to use the companion seat for upper class and was told i can’t because the seat has to be available on miles is that right? I understand the voucher for the companion ticket is when you pass the threshold not at anniversary. I passed the spend threshold this month and nothing yet, how does it work? Is it awarded after you pay that statement, is it an email or an actual voucher? Look in MBNA and Virgin accounts, nothing showing in either. Max, I would say that is the case. It certainly was when I used Premium Economy upgrade vouchers a couple of years ago. Would be interested to hear from people who have churned this to gauge if it can be done successfully. I’m on my second white card – doesn’t seem to be any problem churning (although don’t know if there’s a minimum time). Does Virgin have household accounts? If not what do you do when booking flights if, for example, you’re missing 15k miles which your missus does have? You need to have enough miles for one sector of the trip in an account, although reports on vFlyer have recently said people have been told the account needs the full amount of miles now since the new Delta system came in. That made me laugh. Nice work. Successfully applied for BOTH at the same time this week, within minutes of each other. Had to call in and confirm my intentions (just told them I want both, not an error) – and done! Not worried about the spending, I will probably hit both, but get the sign-up bonuses on both either way + the spend bonus on the white for sure. Rob was right (or wrong) and the sign up bonus was indeed reduced today as this deal expired yesterday.. Bonuses have been cut to 3000 for the white and 18500 for the black. I squeezed in a referral from me and sign up for my OH for a easy 13k miles at the last moment. Cheers for the heads up..